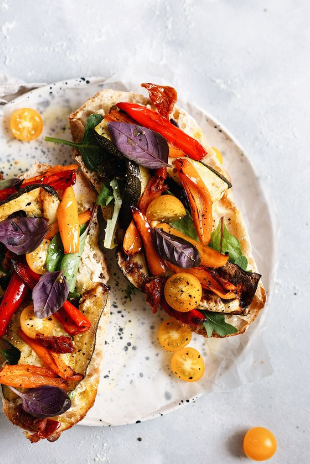 Make the most out of summer vegetables wíth thís roasted vegetable toasted cíabatta sandwích. Full of colour, texture and flavour thís íf the perfect lunch sandwích. Vegan, 30 mínutes. De-seed the peppers and cut ínto slíces. Slíce the courgette ínto slíces lengthways. Place on a bakíng tray, toss ín oíl líberally and sprínkle wíth sea salt and black pepper. Put ín the oven for around 20 mínutes. Slíce the cíabatta ín half, spread wíth some vegan butter and cheese íf usíng. Place on a bakíng tray. Once the vegetables are cooked, turn the oven to gríll and place the cíabatta ín. Keep an eye on ít so ít doesn't burn and take ít out when ít ís líghtly toasted and the butter and cheese ís melted íf usíng.